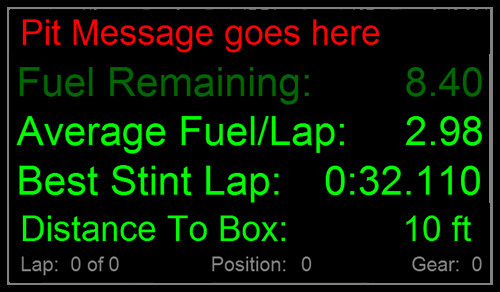 The pit info dashboard displays important information about your car's fuel consumption, lap times, and pit stop messages. This screen can be included in the car's dashboard rotation as described in the Car Settings page. There are four lines of information displayed on this screen. The first shows a customizable message. You can set the color and text of this message. It is intended to display reminders for you when you enter the pits. Perhaps you need to change diff settings or reset anti-roll bars. Whatever it is a simple message can be displayed here to remind you. By default this dashboard will be displayed when you engage the pit limiter. You can change this functionality by using the Limiter Dash drop down in the Car Settings dialog. The second line shows the amount of fuel remaining in your car. This is displayed in the units that you have selected for your car (lbs, kg, gallons or liters). The third and fourth lines display different information depending on the current session. In a practice session, the third line shows the average fuel consumption per lap. This will take a few laps before any useful information is displayed, and will get progressively more accurate with each additional lap. The fourth item shows the best lap time of the stint. The final line shows the distance to your pit box from your current location. Note this is not supported in all sims. In a race session, the third line will show the amount of fuel required to finish the race. This is calculated based on your average fuel consumption per lap and the number of laps remaining in the race. It will take a few laps to read accurate information, and will become more accurate with each additional lap. The fourth line displays how much fuel you will need to add at your pit stop to finish the race. For one stop races this is the amount of fuel required to finish the race minus the amount currently in your tank. It is recommended to add a bit more than this amount to prevent you from running out as you cross the line.